Who said, "It is not in men; God will give Pharaoh a favourable answer?" Personal from Herbert W Armstrong - HAVE YOU tried to induce others to read The PLAIN TRUTH, or listen to The WORLD TOMORROW broadcast - perhaps your wife - your husband - one of your family - a close relative, or friend? Have YOU tried to get others converted - "saved," as many express it? Have YOU started to "preach"? If you have, you have probably stirred controversy, antagonism - lost a friend - or even a wife or husband. But if you haven't - DON'T!!! I know that many of our readers - yes, thousands of you, out of our more than two or three million readers of this magazine - have been led to accept God's TRUTH through this magazine. 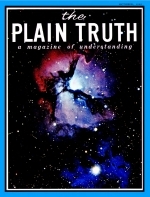 You have learned to LOVE your Creator's TRUTH which He reveals - and which we MAKE PLAIN in this magazine. It becomes the most precious thing in your life. You become excited about it. You are filled with enthusiastic ZEAL over it.